I love lyrebirds. They are so funny. 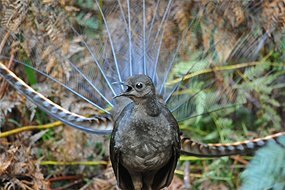 I was watching a documentary on birds once and I saw a lyrebird imitating a chainsaw. I wonder how they do it. I also heard the bird make the noise of two different kinds of cameras. Sometimes, lyrebirds imitate other birds like kookaburras or magpies. I wonder if there is a limit to how many things they can imitate. There seems to be no end to the noises they can make. I think my favourite noise they make has to be either a camera or the chainsaw. Which is yours? I love male lyrebirds' tails. They are so beautiful. It looks a bit like an umbrella when they sit under it. Lady lyrebirds don't have half such beautiful tails. The female birds never seem to be as pretty as the male ones. They always seem to be the plainest. I wonder why? Lyrebirds are one of my favourite birds. I bet you know why. Which is your favourite bird?